Perform a A Reiki session on a horse and a Reiki session on a dog. Within days and months of practice, people find they feel in better control of their lives, become more intuitive and feel a stronger sense of purpose, no matter what their background or career goals are. Although these awarenesses of consciousness are usually not achieved overnight, Reiki Level 1 can help each individual become a healthier ‘body of light and love’, shedding negativity and lower vibrations that often prevent us from achieving these states. All Reiki classes are kept small to keep individual attention at a maximum. Students are encouraged to explore their individual strengths, and each individual’s path and needs will be honored and respected. 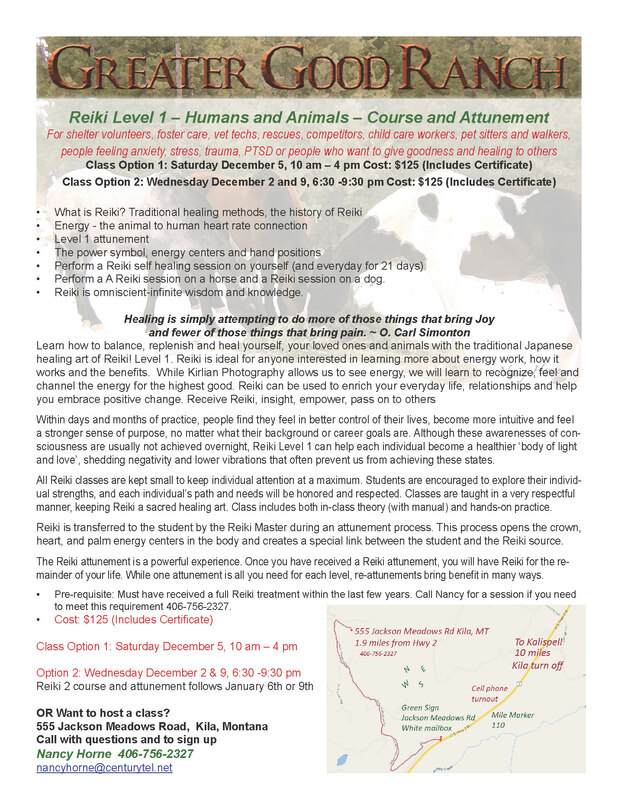 Classes are taught in a very respectful manner, keeping Reiki a sacred healing art. Class includes both in-class theory (with manual) and hands-on practice. Reiki is transferred to the student by the Reiki Master during an attunement process. This process opens the crown, heart, and palm energy centers in the body and creates a special link between the student and the Reiki source. The Reiki attunement is a powerful experience. Once you have received a Reiki attunement, you will have Reiki for the remainder of your life. While one attunement is all you need for each level, re-attunements bring benefit in many ways. Pre-requisite: Must have received a full Reiki treatment within the last few years. Call Nancy for a session if you need to meet this requirement 406-756-2327. OR Want to host a class?